Please call to inquire or order this product. Product dropships directly from the manufacturer. A new and unique synthetic oil blend formulated specifically to prevent softwood (SPF) pitch build up; it will not get gummy or burn on the blade. Lubie® 210 is designed to lubricate, cool, and retard resin and pitch build-up on band saw blades, circular saw blades, and other wood tooling. Additionally it provides over twice the lubricating strength of diesel fuel. Many mills use #210 to lubricate the headrig ways and carriage wheels and rails. Lubie® 210 is low cost, odorless, non-irritating to skin, nontoxic, environmentally friendly and does not contain silicones and will not stain or discolor wood. 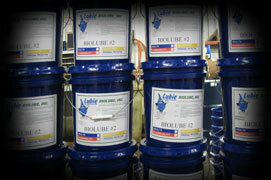 Lubie® 210 replaces diesel fuel in spray, drip, and wick systems. Mills using about 2 quarts per shift of 210 find the cost lower than diesel fuel while eliminating the fire hazard, personal safety, and odor problems of diesel. Lubie® 210 is most effectively applied through Biolube's Lubie® spray systems which give the ultimate in application and volume adjustment. Wick, drip, and other spray systems run #210 effectively. Lubie® #210 is nontoxic, biodegradable and non-irritating. It does not contain any chemicals listed in SARA Title III, Section 313, or in OSHA 29 CFR 1910.